Pinegrove frontman Evan Stephens Hall has confessed to being accused of “sexual coercion.” In a lengthy Facebook post, Hall described his former relationship with an unnamed woman who, at the start of their association, was involved with someone else, explaining that he used his power and privilege as a man and as the lead singer of a popular band to take advantage of the “short but intense” relationship. i should have more actively acknowledged my position of power as a public figure, and also as a man. i have always tried to approach all of my relationships under the premise of equality, but i see now more clearly that the inherent privilege of my gender and the accumulated privilege of being a recognized performer most certainly impacted this interaction. 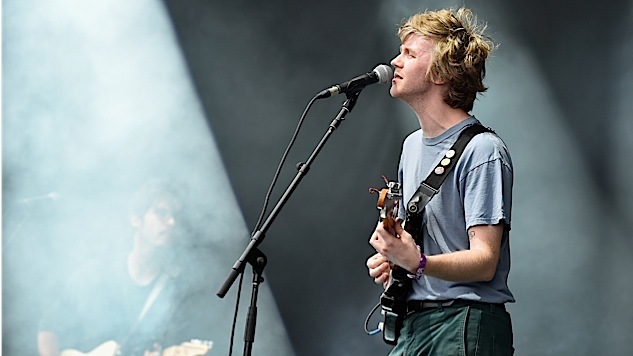 To remedy his behavior and effect positive changes in his life, Hall revealed that he has begun therapy, and as a result, Pinegrove’s upcoming U.S. tour will be canceled and the band will be taking a break. “i am sincerely committed to improving my mental health and the way i treat everyone i interact with,” he says. Pinegrove’s burgeoning career is coming to a pause in the midst some major activity: Their tour was scheduled to kick off Nov. 25 in Cleveland, they just released a new single in “Intrepid” and they also previously confirmed that a new album was in the works earlier this year. Read Hall’s entire statement below (via Pinegrove’s Facebook), and see the band’s canceled tour dates here. i am about to talk about something serious and i want to begin by saying that my actions have caused someone i care about deep emotional pain and i am so sorry. i have been accused of sexual coercion. the accusation comes from someone i was involved with for a short but intense period of time. i won’t say more about this person because i want to respect her privacy and i ask anyone reading this to do the same. the time we spent together was complicated. i believed we were mutually in love and we said it to each other often. but she also sometimes expressed reservation—she was dating someone else, and the dissolution of that relationship would have yielded intense personal and professional consequences. we talked about it thoroughly, endlessly. it was convoluted, heavy, emotional. this whole period felt like an impossible situation with no right answer, but we were working through it together. eventually she broke up with her boyfriend. we got together again shortly after that, which lasted for about two weeks, during which we spent as much time together as possible. she met my parents. we discussed eventually moving in together. while it was by no means a simple relationship, it was sustained tenderly and i believed sincerely that it was mutual. i absolutely never threatened her, i never leveraged anything against her. i believed all of our decisions to be based in love. still, i am coming to terms with the fact that i monumentally misread the situation. i am trying earnestly to follow this line as deeply as it goes to reflect on all of the things i could have done, and can do, better. and in reflecting on interactions with other people i’ve met through music, i see i could have been better there too. i have been flirtatious with fans and on a few occasions been intimate with people that i’ve met on tour. i’ve reached the conclusion now that that’s not ever appropriate—even if they initiate it. there will always be an unfair power dynamic at play in these situations and it’s not ok for me to ignore that. i’m led further to consider my demeanor in most relationships i’ve been in. i can be very talkative and excitable, talking about wild plans, dreams, wanting to share everything. and i’m realizing that part of that confidence stems from my privilege as a man. i also realize that sort of approach doesn’t leave room, or leave time, for my partner to reflect and come confidently to her feelings; that my enthusiasm doesn’t leave space for any ambiguity on her end; it doesn’t leave enough room for a meditative personal process. i believe that happened here too and i feel ashamed that my enthusiasm prevented me from listening as patiently as i should have. i recognize that this is the beginning of a long process of reflection. in an effort to take time to make positive changes in my life and out of respect for what she is going through, we are cancelling our upcoming US tour. we’ll be taking some time off in general. i started therapy on wednesday november 15th and plan to continue indefinitely. i am sincerely committed to improving my mental health and the way i treat everyone i interact with. i am being held to account by the people close to me but the point of this post is not about me — it is an apology to the person i hurt and to the people i disappointed: my bandmates, my friends, my family, our fans. i’m so sorry. i have never felt remorse like this before. i will think about how i could have been better in this situation for as long as i live.